Is your bathroom outdated? You may need a full bathroom remodel. Would you love a bigger shower, updated countertops, glass blocks or a completely new configuration? Do you need help with shower remodel ideas? Bathroom remodeling projects have the highest payback for resale value out of any room in the house. A partial or complete bathroom remodeling is an investment in your home. It’s obvious that when it comes to home improvement projects, one of the first ideas you think of is bathroom remodeling. There are numerous advantages to updating your bathroom, no matter if you’re planning to stay in your home or you’re interested in selling your home in the future. Whether you’re renovating for extra storage space, appearance, increasing home value, or even to make your home more efficient, remodeling your master or common bathroom will greatly benefit you, your family and even your guests. A key benefit of a bathroom remodel is that it provides extra storage. Homeowners are opting to add modern conveniences such as additional large cabinets, open shelving, storage racks, wall storage and other storage spaces to help declutter their home. Considering that the bathroom is one of the most popular rooms to remodel, homebuyers tend to look at this room first. They will thoroughly check it by looking at the water pressure, checking around the toilets for leaks and even looking for natural sunlight coming through the windows. They often look at bathrooms as a testimonial of the entire home. If the bathroom is well-designed and modern, they assume everything else in the home is as well. Additionally, some homebuyers will specifically look for bathroom remodels. It’s no secret that bathroom remodeling can greatly increase the value of your home. A bathroom remodel can literally pay for itself in its return on investment. You will benefit significantly from even small improvements. 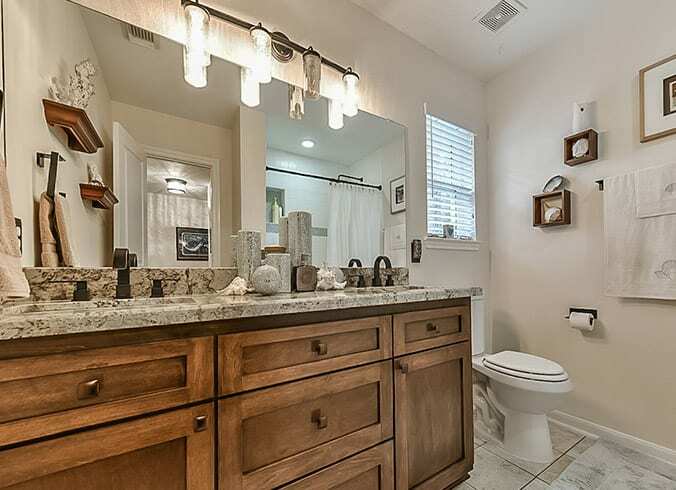 By removing and replacing obsolete features with modern and energy-efficient elements such as sinks, toilets, and baths, you can get a higher return on investment which makes your home easier to sell. However, if you’re staying in your home, you definitely want your perfect bathroom to have your personal style. Since this is one of the most utilized rooms in your home, your bathroom should look and feel as comfortable as your master bedroom. So, if you’re planning to update and remodel your master bathroom, be creative. In addition, a bathroom remodel gives the homeowner the opportunity to fix unsafe fixtures such as leaking sinks, cracked tiles, or broken toilets. And, did you know that upgrading your bathroom can also improve your overall health and wellbeing? If you’re interested in going green, or if you’re looking to remodel your bathroom to save money in the long run, upgrading bathrooms with energy efficient features, such as lighting, showerheads, and faucets, saves gallons of water and reduces energy costs. Are you concerned about the cost of remodeling your bathroom? At All Star Construction, we know that renovating your bathroom can be a chaotic experience. That is why you need a contractor you can trust to help you plan your budget, choose the features and select the best materials to use. We only work with the finest construction materials and offer an unlimited selection of the highest quality bathroom products. Let All Star Construction design your new bathroom around your lifestyle. New Countertops, Sinks, and Accessories – The look and efficiency of new fixtures greatly improve the aesthetics of your bathroom. You can create the bathroom you want with the accessories you choose to match your style. Custom Shelving and Cabinets – Customized shelves and cabinets are an important permanent fixture to any bathroom. They are built to fit your bathroom perfectly with the look, style, and colors you want. Shower Remodels and New Shower Installs – A beautifully remodeled shower will provide years of comfort and enjoyment. With numerous models and styles, the possibilities are endless. Lighting and Fan Upgrades – It’s no secret that lighting and fan upgrades lead to energy savings and a fresh look. These simple upgrades can transform your entire bathroom. Glass Block and Privacy Window Installation – A glass block shower or window can turn an everyday bathroom into a spectacular showpiece. This look provides a visual concealment while allowing light to come through. Tub and Jacuzzi Installation – Jacuzzi tubs are known to improve sleep, reduce stress, and even promote healthier skin. 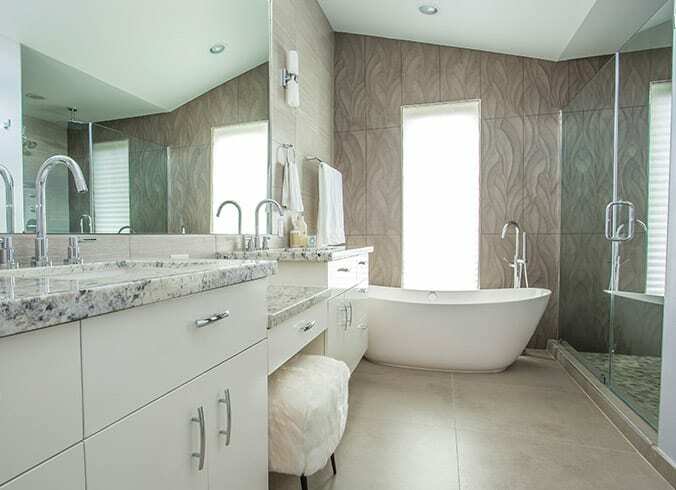 Having a tub with a separate standing shower seems like a luxury to homebuyers. Added Features to Accommodate Disabilities – We can make your bathroom ADA compliant with the addition of shower seats, mirrors, grab bars, special shower spray mechanisms, and non-slip surfaces.